If you love the look and versatility of a crossover but don't need all the space, or find city driving difficult, we recommend considering the 2017 Buick Encore. Coming in a little smaller than other crossovers in its class, the 2017 Buick Encore still delivers a confident ride with a high driver's seat offering a commanding view of the road. An upscale and thoughtful interior keeps everyone comfortable for long journeys. Find your 2017 Buick Encore in Missouri and Illinois at the Chris Auffenberg family of dealerships. Smartphone app integration and Bluetooth compatibility means that drivers and passengers in the 2017 Buick Encore will have access to music and online content to keep them entertained and connected while on the road. Standard Apple CarPlay and Android Auto are also found on the updated interface. 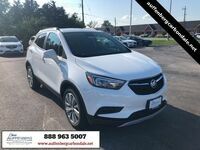 Read more about the 2017 Buick Encore trim levels below and then visit the Chris Auffenberg family of dealerships for a test drive to experience the 2017 Buick Encore from behind the wheel. The 2017 Buick Encore is available in six trim level offerings. This means that a variety of price points and amenities are available so there should be a good fit for just about everyone. Find some of the 2017 Encore key features listed by trim level below. 1SV Trim Key Features | 18-inch Alloy wheels, keyless entry and ignition, heated mirrors, roof rails, 60/40-split folding rear seats, a rearview camera, Bluetooth compatibility, two USB ports, and an 8-inch center touchscreen with smartphone app integration. Preferred Trim Key Features | The Preferred trim is outfitted similarly to the 1SV trim but also adds floor mats and a cargo cover. Sport Touring Trim Key Features | Foglights, a rear spoiler, available Bose® audio system, an available blind-spot warning system, and available rear cross-traffic alert. Preferred II Trim Key Features | Dual-zone climate control, an auto-dimming rearview mirror, a 120-volt power outlet, standard blind-spot warning system, and standard rear cross-traffic alert. Essence Trim Key Features | LED headlights, leather upholstery, heated front seats, and a heated steering wheel. Premium Trim Key Features | Front and rear parking sensors, forward collision warning, lane departure warning, automatic wipers, and an available seven-speaker Bose® sound system. Whether you choose the base trim level or the top-of-the-line Premium trim, the 2017 Buick Encore is sure to deliver a smooth and comfortable ride. To learn more information about the Buick crossover, fill out the form on this page and a dealership representative will get back to you with answers to your questions as soon as possible.